Through years of struggling to keep our rhododendrons and azaleas alive during the hot summer months with just about every kind of watering system, including impact sprinklers, soakers, drip systems and even the bucket brigade, we found we were drowning some while others were drying up and dying. Finally after several years of persuasion by our son-in-law, an apple farmer in Chelan, Washington, we decided to try the system he uses in his orchards. During the hottest week of the summer of '85, with our beloved plants dying daily, we installed the new system and now wonder why we didn't listen to Fritz years ago. This is a system of micro-sprinklers that puts out a fine mist, duplicating the tropical moistness rhododendrons like so well. It gives off a soft caressing mist that surrounds even the most delicate flower without harm. A slight breeze swirls the mist in and around the leaves and plant and refreshes the garden like a soft summer rain. The water then settles to the ground keeping the moistness on the shallow roots. Rhododendrons do not wish to stand in water or in soil that is soggy, although they enjoy a cool, moist soil. Because their roots are shallow, heavy watering is a waste and takes the nutrients on down past the root system. Low volume sprinkler system at work. Since the use of these micro-sprinklers is relatively new in orchards and vineyards and even newer in rhododendron culture we have had to rely on the experience of orchardists. Micro-sprinklers have reduced application rates significantly and are able to spread the available water over more acreage than impact sprinklers. An impact sprinkler primarily throws a stream of water, a micro-sprinkler uses a spinning head which throws a circular pattern of small droplets. Each droplet is a sphere, the surface of which is exposed to the air. With more droplets of smaller size the actual water-to-air surface is increased significantly. Increased water-to-air surface increases the absolute amount of evaporation. This brings up another plus, the use of micro-sprinklers for frost control. They are efficient at raising air humidity levels, creating a humidified "micro-climate" and can provide frost protection at lower application rates. During the early spring when the delicate buds and flowers are starting to open they can be protected by a steady flow of droplets that completely and gently encircle the bud. The buds have to be protected from thawing until the temperature raises to 34. 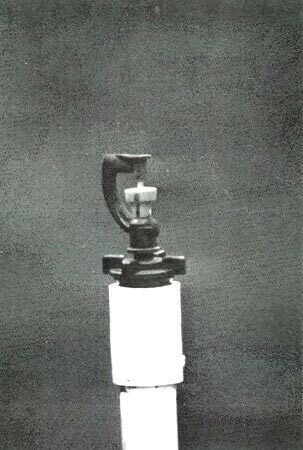 The volume of water used by 40 to 50 micro-sprinklers is similar to that of one impact sprinkler. An impact sprinkler waters a large circumference with the outer ring getting most of the spray and some of the inner circle getting little or no water. During blooming season the harsh heavy spray does little to enhance the beauty of the flower. 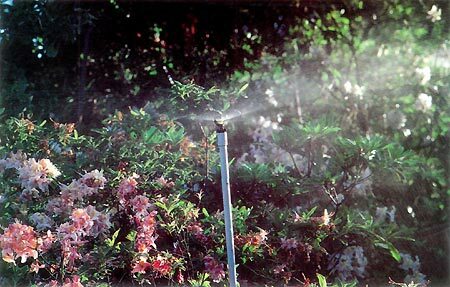 The system of micro-sprinklers reduces the amount of water used, distributes it evenly and is gentle with both foliage and flowers. With all the benefits of systemized and economical watering, freeze control, etc. it would seem almost too much to expect the installation to be comparatively simple and economical. Approximately 40 micro-sprinklers equals the cost of one standard impact sprinkler. Our particular garden covers approximately three acres. It is on a hill that is very steep in places, has many ridges, ledges, corners and strips along buildings and roads but all our plants are covered with equal care. Two of us basically installed all three acres, plus two lath houses in approximately one week. The micro-sprinklers have features that permit a variety of applications; for example: peripheral or sectional spray irrigation, sprinkler irrigation, misting, change of diameter coverage or change of droplet size. A final feature that we added to our system was some good quality, battery operated timers. We use battery operated timers to eliminate the expense of extensive electrical work and to allow us to have them in remote areas where electricity is not available. Routine watering for 10 minutes twice a day in the early morning, about 5 AM, and late afternoon, after 6 PM, is most effective for our garden. However, we frequently turn them on just for the joy of watching the beautiful effect. For more information on the Minch's garden see the article "The Indomitable Fred Minch" by Linda Draper, ARS Journal, Vol. 40:1, Winter 1986. Jean Minch, an avid photographer, shares her husband Fred's enthusiasm for growing rhododendrons.